I keep saying I am going to blog more, and then the days get away from me and I am silent for far too long. Last fall was busy with a few big projects. 1) a complete overhaul of a client’s Civil War era wardrobe and all the underpinnings. This included day bodices, evening bodices, travel coats, and the works! Nothing picture-worthy, but fun to work on. 2) a custom set of Regency stays. 3) another appearance at our local Fiber Arts show, this time with Mr. Forest in his 18th century nobleman’s outfit. 4) some Christmas crafting, including hand-embroidered stockings and pockets (no pictures yet) and some machine-embroidered pockets. As well as aprons, a dolly, and some other crafty, non-costume gifts. 5) testing out patterns, ordering supplies, and making lesson plans for my first teaching gig, a late Victorian corset class. In the end, I settled on TV110 for the pattern, and have a nearly finished new corset for myself – it just needs a little more flossing before it is finished. In the meantime, here’s a picture of the machine-embroidered pockets. Not period-accurate, by any stretch of the imagination, but the pattern has a Jacobean influence, and the recipient doesn’t give a fig about accuracy, anyway. 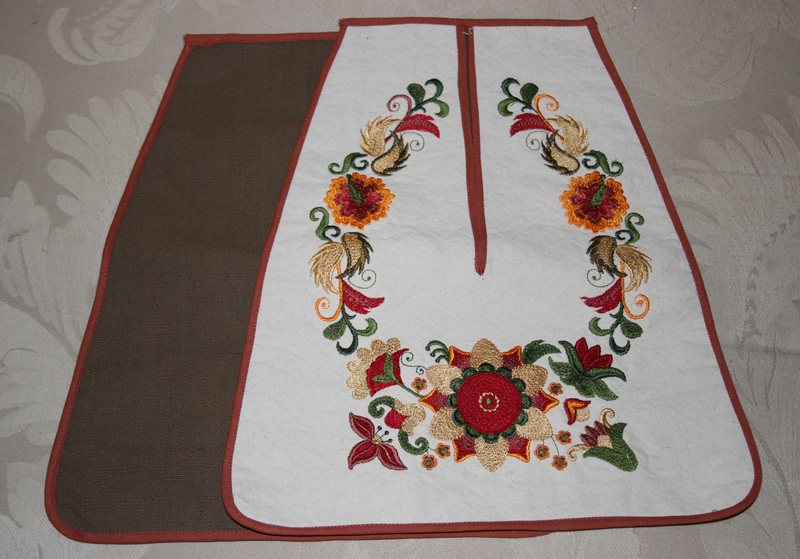 18th century machine-embroidered pockets for Z.